Until now, I have always worked in industries that require me to be on my feet all day. From retail to flight attending and even hospitality, I was always getting a whole lot of movement in my day without even noticing. Having just started my first sit-down-at-a-desk-looking-at-a-computer-all-day office job, I have come to realise just how important incidental exercise really is. Stationary jobs are dangerous for our waistlines and for our general health. I for one, am suddenly very aware of what I am putting in my mouth and how quickly my weight could blow out if I am not careful. So what are some ways we can all get more incidental exercise in our day? And how can you make sure to remain healthy at work? 1. Take The Stairs. Swap the lift for the stairs. This has to be one of the simplest ways to up your daily movement. It’s great for your legs, booty and getting your heart rate up too. 2. Stretch it out. Make it your mission to stand up and stretch or go for a quick walk around the office every 20-30 minutes. Set a reminder on your computer or phone if you must. Stretching is a great way to avoid tension in your muscles and even prevent injuries that can occur from sitting too long making repetitive movements at a computer. 3. Go For A Walk in Your Break. None of this eating lunch at your desk stuff, ok? Not only is it disgustingly unhygienic (there are more germs at our desks than there are on a public toilet seat… I know, YUCK!). But your lunch break is also a perfect opportunity to go for a walk, get out in the sunshine and get a few extra steps in. 4. Better Yet, Go to The Gym! If you are someone that struggles to find the motivation to get yourself to the gym before or after work, start a routine of going during the work day instead. Even if it means, getting to work 30 minutes earlier or staying 30 minutes later, so you can have a longer lunch break to fit in that workout – what an amazing way to break up the mundane work day. The exercise will fuel your brain and get the endorphins flowing to push you through the afternoon slump too! 5. Snack Right. 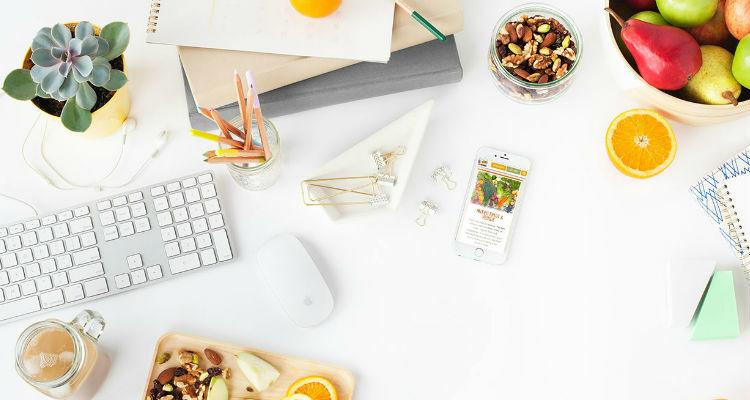 If you are a notorious snacker at your desk – make sure you pack yourself some healthy snacks for those munchies moments. Chop up some carrot sticks or fruit and munch on those throughout the day rather than reaching for junk. 6. Drink Up! Coffee is a work day essential, yes. But I’m talking about water. Keep up your H2O intake throughout the day to stay hydrated. You might be surprised that your snacking decreases too – sometimes when we think we’re hungry, we’re really just thirsty. Bonus: the more water you drink, the more you’ll have to pee = more steps! 7. Stand Up. If your office has them, ask your HR department for a stand-up desk, so you can alternate between sitting and standing while you work. You could even do some cheeky calf raises or lunges while you type away – if you are game/have a friendly enough relationship with your colleagues. 7. BYO lunch. Stop the unhealthy lunch cycle of buying your meals every day and pack your lunch instead. Prepping your own healthy meals at home is the best way to ensure you know exactly what you are consuming (no sneaky preservatives, sugar or salt), as well as a great way to save some coin. 8. Take Public Transport. Instead of driving to and from work every day, why not hop on public transport. Even just the walk to the train or bus stop can be enough to get your steps up. Plus, hello forced read, scroll the gram, listen to podcasts or meditate. 9. Park further away. If public transport really isn’t your thing, still make the commute to work in your car, but park further away than usual. Make it so you have a good 5-10 minute walk to get to and from work to your car. The walk bonuses as a chance to clear your mind and reset for the day ahead. So there you go, 9 simple ways you can up you movement throughout the day without leaving your desk so often that your boss calls you in for a meeting. Do you have any more suggestions? Leave me a comment below. I’m really determined not to fall into the unhealthy traps of ‘office life’. Be the first to receive new blog posts and exclusive content straight to your inbox.